While sitting here waiting to see if Blogger would take my pics tonight I was deciding what to do if it wouldn’t. The wait was forever and I actually started composing bad cinquain poetry in my head while the minutes ticked by. Be glad the pics loaded! I’ll have to file away my awkward ode to Blogger for the next time it goes wonky on me. I tried adding these pics to last night’s post earlier this evening and they still wouldn’t take. Yet I can add them here. Very mysterious. Plenty of folks blog without pictures and those that do a good job of it are able to write well. I hope somehow that my mediocre pics and mediocre writing somehow make up for each other or cancel each other ou t or whatever. 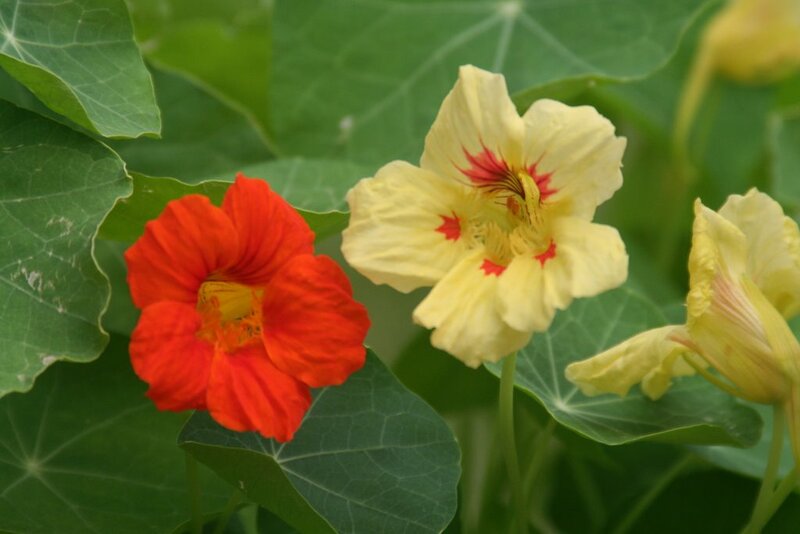 Anyway, back to the subject at hand – Nasturtiums. Both the leaves and flowers are edible; at one time even the flower buds were pickled like capers. I’ve read that they are sometimes planted beneath fruit trees or tomato or squash vines to trap insects that would like to munch on the more valuable property above them. 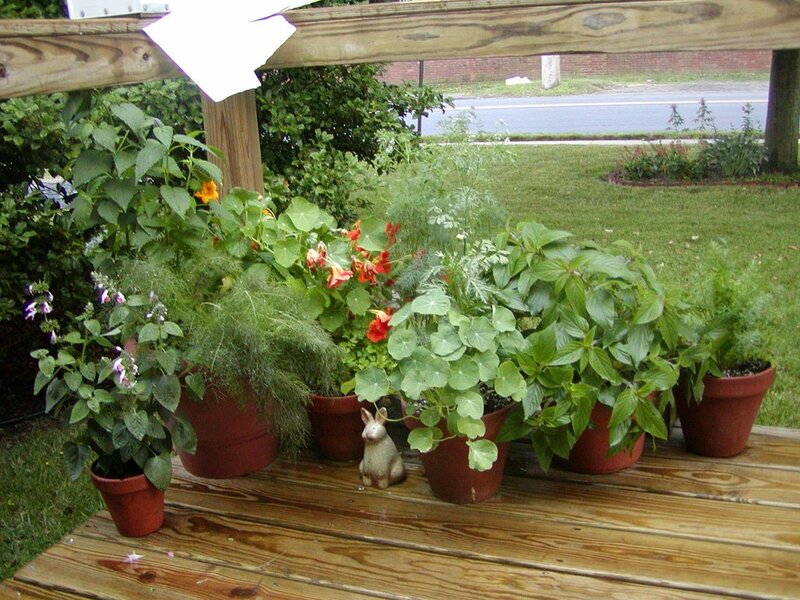 I plant mine in pots on the front steps with some other herbs like dill and pineapple sage. They have a peppery taste that I like in salads mixed with sweeter greens and the flowers make a pretty garnish. They are easy to grow fro m seed and like sun and moisture, but not a rich planting medium as too much fertilizer will keep them from blooming well. Aphids seem to love them and the older leaves develop a strange mottled appearance, so I pick the young leaves for eating. Snails and slugs like them, too. Books say that they’re also favored by hummingbirds as each flowers holds a small well of sweet nectar inside it. Last night I added some fresh-picked flowers and leaves to the salads for the bunnies – these and dandelion flowers are a favorite treat. The bunnies eat a lot of greens around here – twice a day in heaping amounts. Each bunny seems to have a favorite, but everybunny enjoys the little bits of carrot and fruit that each salad is laced with as a *treat*. Most people who breed rabbits don’t believe in feeding greens (or hay, for that matter), but housebunny people do. Fresh food is healthy for bunnies, as is hay, but it takes a bit more work than just feeding pellets. 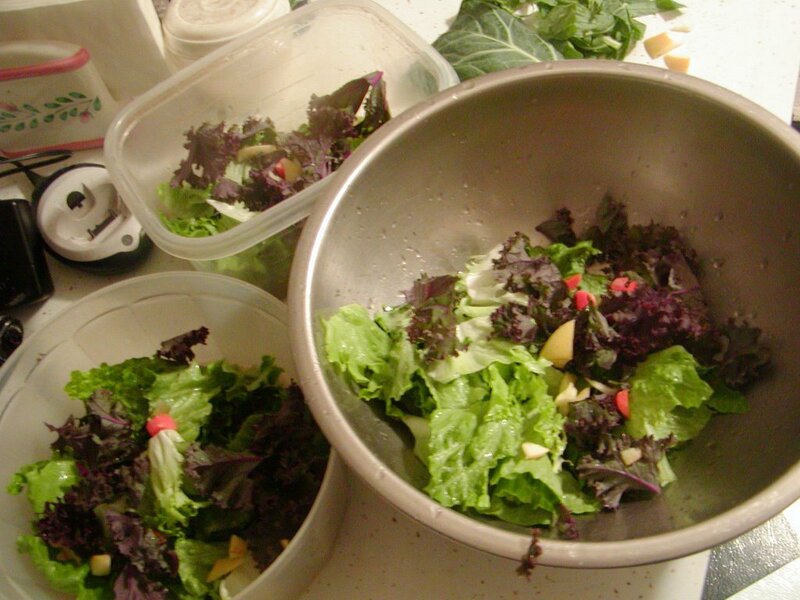 Salad-making is part of my routine and I prepare the next day’s salads the night before so that I don ‘t have to be chopping lettuce in a daze when I first get up for work in the morning. I prepare a portion for each bunny (or pair of bunnies for Boomer and Cricket) according to their appetite and preferences. I like to feed a nice variety of greens, but our daily staples are Romaine and green-leaf lettuce, parsley and cilantro. I also include at least one *dark green*, high-vitamin item like dandelion, kale, turnip or mustard greens, or collard greens each day. Some have to be careful with these because of their high calcium content (which may lead to bladder stone/sludge issues), but I don’t feed that much to have to worry about it. Occasional additions are dill (a favorite, and usually on the menu), red-leaf lettuce, arugula, mint, frisee, anise fennel, chicory, swiss chard, etc. – I buy what is nice and fresh from the market. I also like to feed some extras, in season, like berries, or broccoli, or Brussles sprouts, or tomatoes. Yes, my bunnies are spoiled! The last few years I’ve been growing some extras that aren’t available in the market and herbs that are easy to grow in pots. (I have a lovely photo that Blogger suddenly won’t let me upload – darn!) Parsley, cilantro, and fennel are easy to grow (and loved by some butterflies for laying eggs) so I grow them in pots or in the veggie garden and use the *extra* to supplement what I buy at the market for the bunnies. 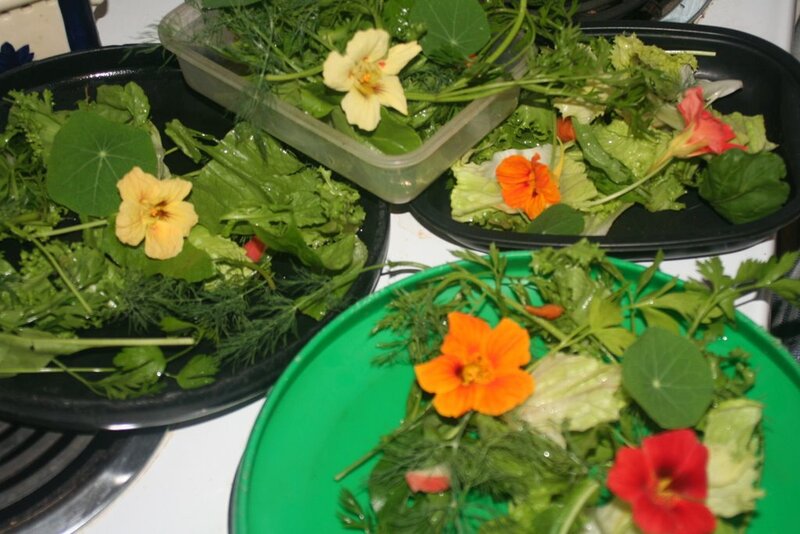 Yesterday (imagine another lovely photo that Blogger won’t let me upload) the bunnies’ salads were adorned with red, yellow, and orange nasturtium flowers and leaves, which have a pleasant, peppery taste. I’m off to fix salads for tomorrow and vent my Blogger frustrations on the cutting board. Check back later for the rest of what I intended to write. 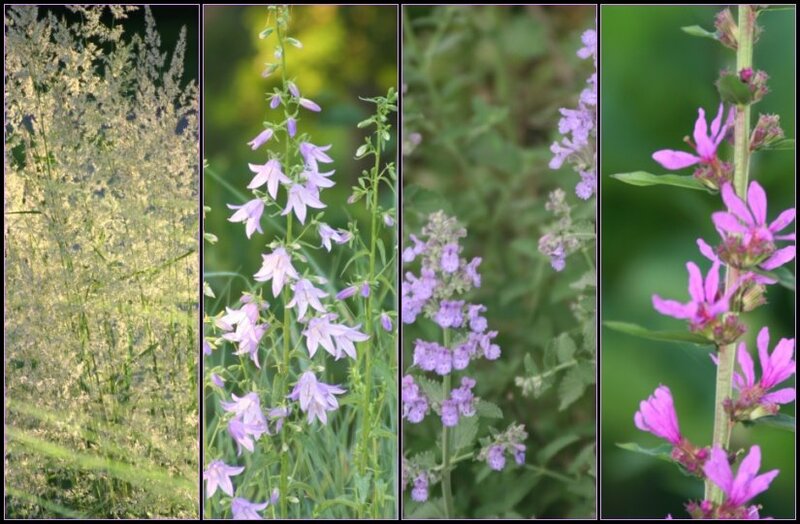 An excellent list of key plants for the butterfly and hummingbird garden is available in PDF format from NJ Audubon at this link. I’ve found this list to be very helpful when planning my own garden and can attest to the popularity of the *Chocolate Cake* plants that are listed there as most attractive to butterflies and hummers. What is especially nice about this list is that it annotates those species which are native. Another top-ten list from John at A DC Birding Blog. 1. Osprey: I anticipate their return each March; their sweet calls overhead are very much a part of any time spent at Sandy Hook. 2. Ovenbird: Not a musical song, but one I love to hear when searching the woods for other spring arrivals. 3. Carolina Wren: A song I associate with the shortening days of autumn, crisp weather, and home. 4. Baltimore Oriole: Hard to classify this song, but easily recognized. Orioles don’t sing much in our neighborhood in spring, but young of the year will practice and chatter throughout July from the treetops. 5. Willet: The one shorebird I can easily identify and a call I love on a spring day at the shore. 6. Great Horned Owl: Reminds me of cold winter nights. I love having these birds in the neighborhood and their calls bring goosebumps and force me to stop whatever I’m doing to listen more closely. 7. Killdeer: The eveywhere bird – background noise – at home, at work, at the shore, in the middle of the night. They return to my area early and their plaintive cries alert me to the changing season. 8. Northern Bobwhite: Sadly, a bird I associate with a few, very specific places. Hard to get to hear in my area, and heartening. 9. White-throated Sparrow: A winter companion and another bird of home. 10. Great-Crested Flycatcher: Another bird I associate with very specific places, but a favorite for some odd reason. 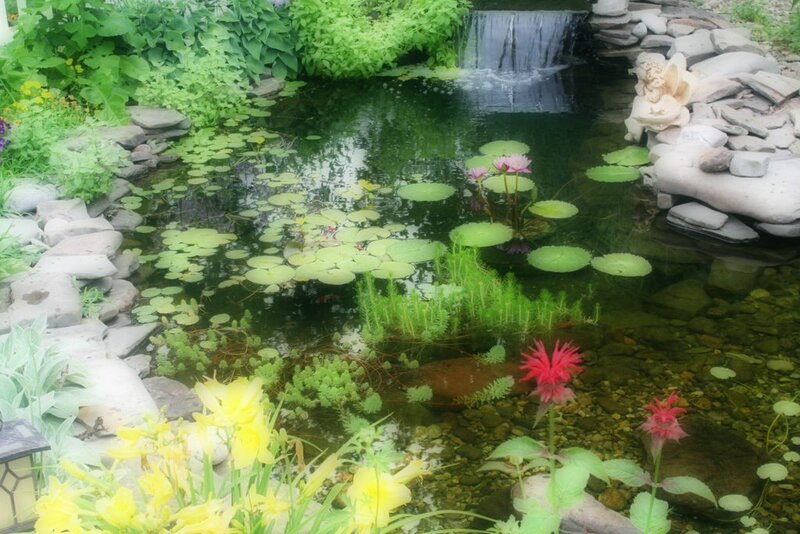 The pond is overflowing with color now that warmer temps have set in. Daylilies, bee balm, hostas, and ladybells blooming on the margins all try to distract my attention from the water and fish. Mint is creeping from every wet rock edge. Last night’s tree frog is calling again from somewhere in the bog garden; maybe high up on one of the Joe Pye stems, ready to decend for another evening spent advertising his new-found territory. The Parrot’s Feather is spreading across the surface of the water and creating shade and cover for the fish as it grows. Last weekend I bought this beautiful purple waterlily; it’s a tropical, so I’ll have to try and overwinter it indoors somehow. Beautiful! Three flowers were open today, but I focused on just this one. This is one of the white butterfly koi that was hiding the last time I was out taking pics. One of many volunteer Floating Hearts (Nymphoides peltata) – visible in the opening photo along the left edges of the pond – the small leaves are heart-shaped and resemble a waterlily. Not sure where it came from, but it sure is pretty! And free! The other white butterfly koi who is turning more yellow as the days pass – beautiful, hungry fish! I love late afternoons by the pond – less glare from the sun lets me see the fish beneath the water and the neighborhhood is quiet. If it weren’t for the mosquitos, I think I could spend hours out there. It mesmerizes me somehow; the ever-changing patterns of fish and leaf and moving water. I’d like to have a pic to show you of the little brown frog that has been calling loudly from the yard and pond all evening long. During a late dinner my husband asked me, “What bird is that?” and with the fans blowing and the rain, I couldn’t hear very much so I told him it must be a mockingbird. Ever curious, I stepped outside after dinner and knew it was no mockingbird! I went back in for the flashlight and searched around my neighbor’s fence because the sound seemed to be comng from that direction. I didn’t find anything and, of course, whatever it was went quiet as soon as I came out with the flashlight. A little while later it started calling again, but this time the sound seemed to be coming from the far back of the yard by the pond. I roamed around for a while with the mosquitos and eventually found this little brown frog with black markings calling from the rocks beside the pond. He’s not shy at all and continued to call while I held the flashlight by him. When I was a kid the last day of school and the start of summer vacation meant freedom. Being out of school didn’t matter so much to me, but all of that free time laid out before me and its lack of resitrictions meant the world. 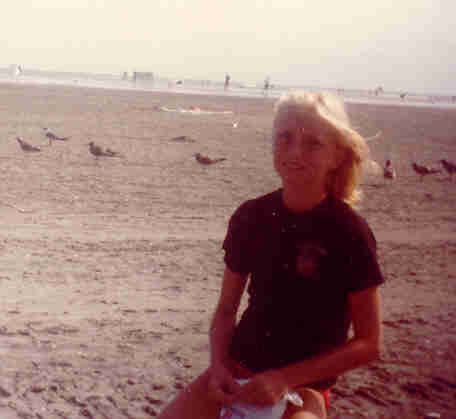 There were days at the beach and camping trips in Maine and Florida, Girl Scout camp and afternoons at the pool club. But most of the time there was nothing but my friends from the neighborhood and our imaginations stretched to fill a summer’s day. Complaining of boredom or not knowing “what to do” was not encouraged by my mother. She sent me “out to play” and wouldn’t expect me home until the streetlights came on. It was that way with all of us kids. We played in the creek, built forts in the empty field down the street, rode our bicycles and roller-skated, and ran through everyone’s backyard playing *army* and hide-and-seek. 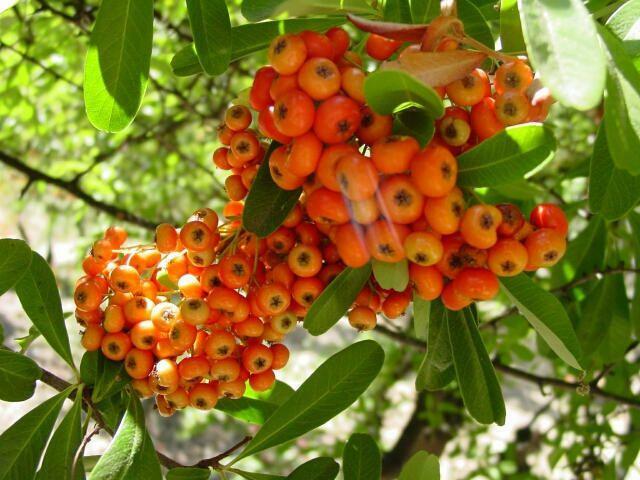 I can remember mixing up *potions* from the orange berries of the firethorn bush and the red yew berries that grew beside our house – thank heavens none of us were brave enough to eat any of it. If we ran out of things to do, we’d play cards in the *cave* beneath the spirea bushes. I understand that we live in different times, but has the world changed so much in twenty years or is it just parent’s perceptions that have changed? My co-workers all send their kids to camp. The sad reality is that most moms work and aren’t home to supervise. But even among the families in my neighboorhood, where all the moms stay at home, kids still go to camp for most of the summer. When they are at home, very seldom do I see them running and playing and getting into mischief. Why is that? Do kids not know how to play anymore without an adult directing them? In “Last Child in the Woods: Saving Our Children from Nature-Deficit Disorder” (linked in sidebar) the author makes the assertion that time spent outdoors builds confidence in children and nurtures imagination and creativity. The greatest barrier that prevents parents from allowing their children the freedom to explore and play outdo ors is fear. 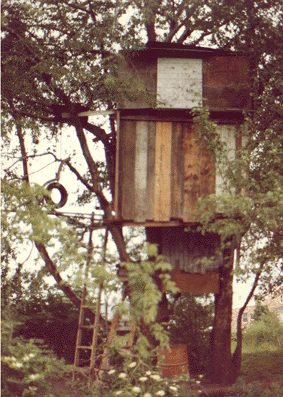 The author cites a study which found that between 1970 and 1990 the area around home that children were allowed to play in without direct parental supervision has shrunk to a ninth of what it had been in 1970. Only 36% percent of kids are permitted to walk or bike to school on their own. Are our neighborhoods so unsafe that we can’t allow kids that one small freedom? If we schedule every moment of a child’s day with play dates, and dance practice, and homework can we be surprised that they don’t know what to do with themselves otherwise? I treasure the memories of those summer days and feel sorry for kids growing up surrounded by so much fear of strangers and crime. I have to believe that my early experiences in the *great outdoors* just outside my backyard must have done something to create the love of nature that I feel now. I wonder if kids still have special secret places that they go to when they need solitude. Moisture-loving Swamp Milkweed (Asclepias incarnata) is slowly establishing itself in expanding colonies in the garden and bog. 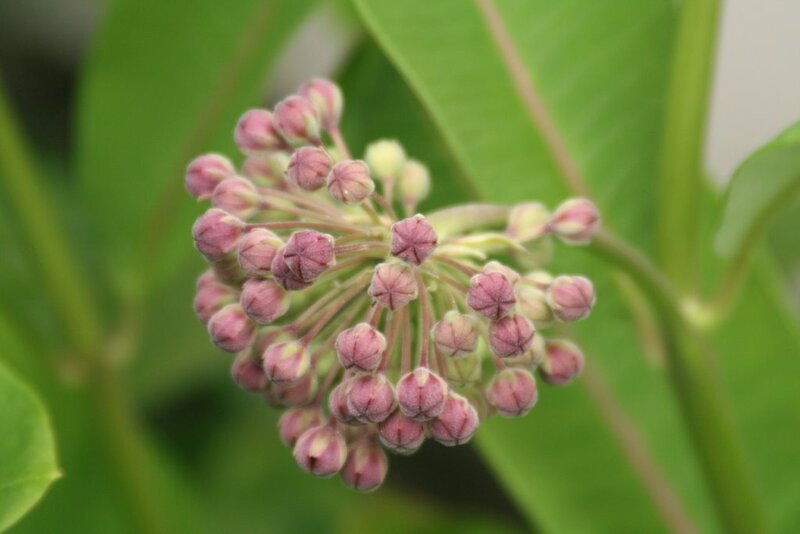 The individual flowers, shaped like an hourglass, are a purple-pink color and form umbrel-like clusters at the top of the stalk. The plants can grow to about 4 feet tall and are an important nectar source for many pollinators, like native bees and wasps, flies, and butterflies. 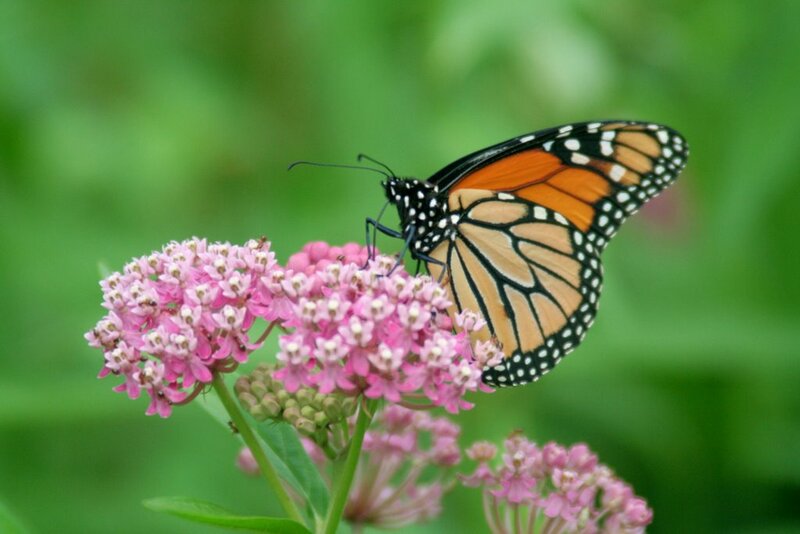 The bu tterly most often associated with Milkweeds is the Monarch, which lays its eggs on this species alone. 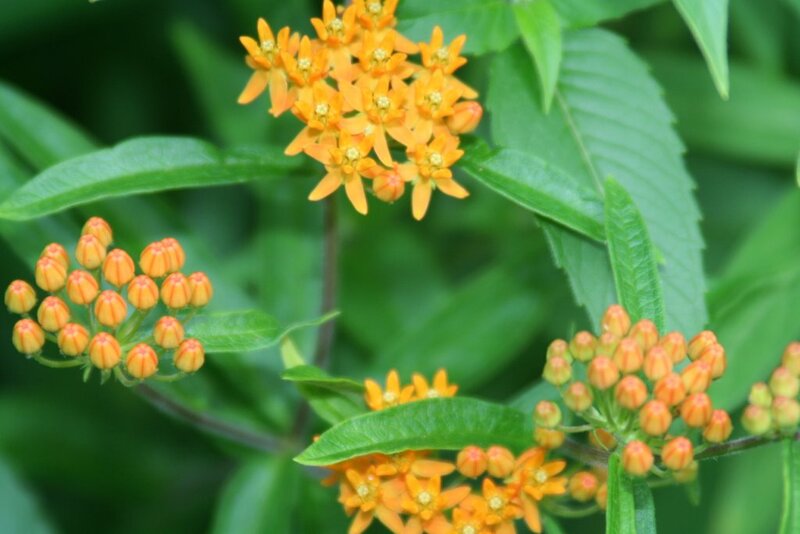 I’ve read that Swamp Milkweed is not often used in this way by Monarchs; they are said to prefer Butterfly Weed (pictured at left) or Common Milkweed (pictured below). I always inspect the underside of the lower leaves for eggs, and one summer had three or four catepillars happily munching away. The most fragrant of the milkweeds is likely Com mon Milkweed, which is less showy, but abundant and often grows in waste places and along roadsides as a *weed*. Including milkweeds in the butterfly garden is an easy way to help Monarch butterflies and other pollinators. My bee-keeping friend says that the pollen is especially loved by honeybees, but many die trapped in the blossoms. I didn’t find any insects visiting the flowers late this afternoon, but did find quite a few milkweed bugs on the foliage, as well as some aphids and ants. Milkweed bugs feed on the leaves and seeds and taste as bad as monarchs to predators that try to eat them. Feeling a bit silly this evening so thought I should post an equally silly bunny pic! This is Missy doing her best imitation of a Mermaid for the PetBunny Halloween Ball in 2004. Our Auntie Judith from PB is a PhotoShop wizard and creates costumes for all the bunnies on the list each year. Pics of other PB bunnies in costume are available here. Auntie Judith’s bunny, Mr. Bee, is one of my favorite PB bunnies and Judith takes gorgeous pics of him. 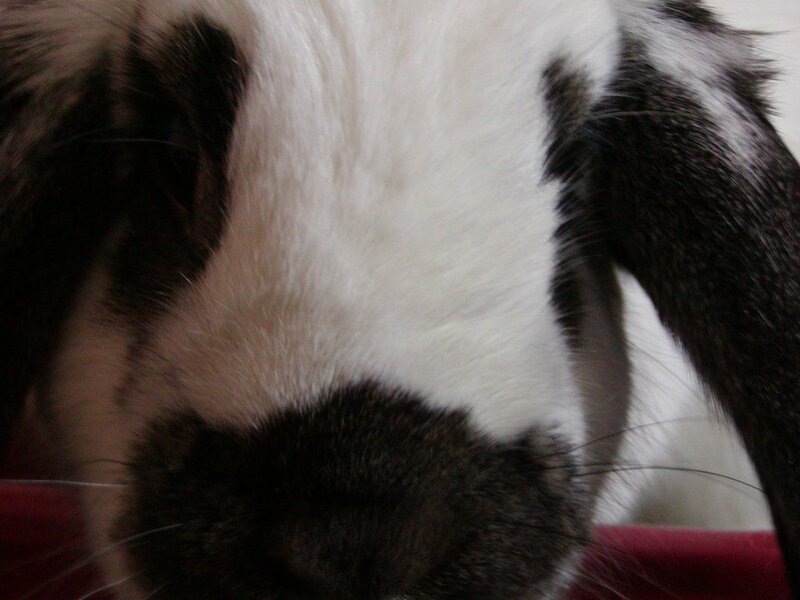 Have a look at her bunny gallery for a real bunny fix! If you look at the Halloween pics, keep an eye out for some of my other bunnies, and let me know if you *recognize* them in costume! Taking five minutes at the end of each day, with camera in hand, to consider the blooming bounty of my garden leads to an abundance…. of photographs! I remember longing for such color and finery just a few months ago in the depths of winter. I focused my attention this evening on the upright, lance-like plants that are blooming around the pond. The flower stalks on this tall grass were impossible to photograph, but so beautiful backlit by the setting sun. To the right is Ladybells (Adenophora liliifolia) a favorite, and easy to grow with good moisture. The nodding bell-shaped flowers lead to another of its common names, False Campanula. A beauty and compensation for my utter lack of ability at growing foxgloves and delphiniums. Next, the flower spikes of catmint, which is very generous and grows everywhere in my garden to keep the bumblebees occupied. Lastly, the noxious Purple Loosestrife (don’t hate me Susan!) which grows in the bog garden beside the pond. 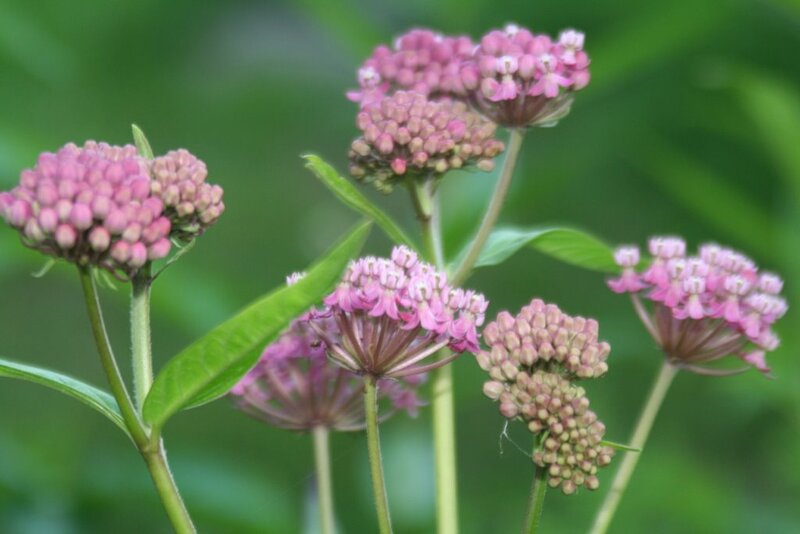 It behaves well there – I help it along by deadheading religiously so as not to allow it to disburse its seeds, but mostly I think the Joe Pye Weed that grows beside it keeps it in check. The Joe Pye is already twice the size of the loosestrife and needs to be pinched back before long, otherwise it will tower over the rest of the bog at 4 feet or more.